Our clients came to us in need of an updated look in their master suite, with a goal of turning their dated bedroom into something sophisticated and trendy. We decided to go with a light and airy color palette, as the pale blues, cool grays, and powerful golds complement one another and are timeless yet current. Tailored furnishings and subtle accents in the lighting offer a refreshing style while the natural textures and wall decor add depth and interest. The pale blue, gold, and cream color palette continues into the master bathroom. 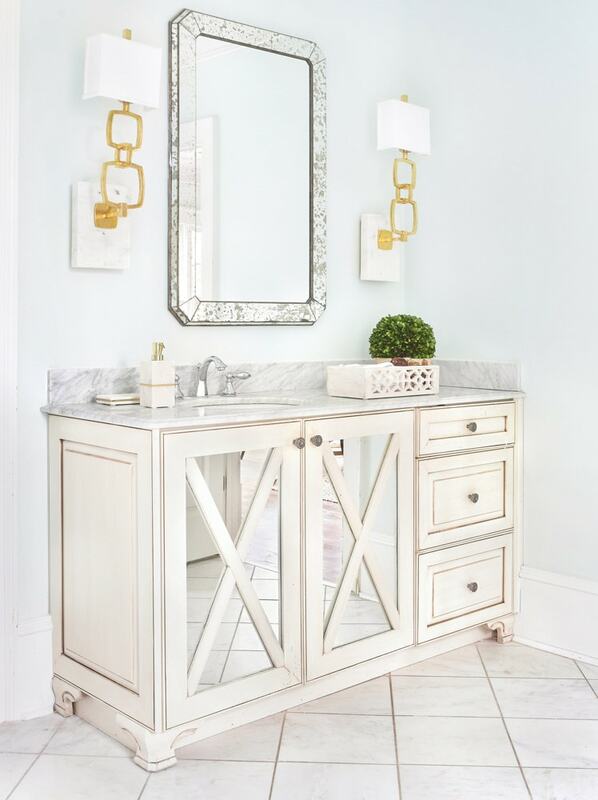 Mirroring the same detailed lighting with gold accents, this space is given an extra splash of glamour through the metallic vanity mirror and mirrored vanity cabinets. We supplied all furniture, accessories, lighting, and artwork for this project.